New Book from Praeclarus Press--Phantom of the Opera: A Social History of the World's Most Popular Musical--Celebrates Phantom's 30th Anniversary October 9th. 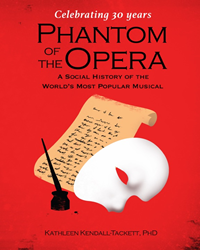 Praeclarus Press is pleased to announce a new book that provides a social history of the Phantom of the Opera--the world's most popular musical. This book commemorates the 30th anniversary of the Phantom of the Opera on October 9th and tells the story of the musical, movie, and sequel, and the people and the controversies behind them. The social history of the Phantom of the Opera tells the stories of the people and controversies behind the musical. The Phantom is great. The social history of Phantom is even better. On October 9, 1986, the final curtain came down on the opening night performance of Andrew Lloyd Webber's The Phantom of the Opera. The audience responded with a stunning 10-minute ovation. Clearly, it was a good sign. Lloyd Webber likely had a major hit on his hands. At the time, however, it's unlikely that anyone knew that Phantom would break every record is theater history and go on to be the longest running musical of all time. Thirty years later, it has won over 70 major theater awards, been translated into 15 languages, played to audiences in 35 countries, totaling 140 million people, and grossed over $6 billion. The stage show, however, was not what drew Dr. Kathleen Kendall-Tackett to this story, as she describes in her new book,Phantom of the Opera: A Social History of the World's Most Popular Musical. "What drew me to this story was what happened next. It started when they made the Phantom movie. Fans of the original stage show hated when Gerard Butler was cast and they hated the choice of director. They were all over the Internet with their opinions. Then there was the even more controversial sequel, Love Never Dies. In this case, 12 people armed only a Facebook page and website took on Andrew Lloyd Webber and his vast resources--and prevailed. Love Never Dies closed in London 18 months later after losing a great deal of money. However, Love Never Dies 3.0 rose from the ashes and was actually better. The protest seemed to have improved the show. The Love Never Dies protest also demonstrated a fundamental shift between audience and creator. What the audience thinks has more influence than ever before. Lloyd Webber and others are quite unhappy about that." These controversies, and the people behind them, are chronicalled in this social history of Phantom of the Opera. In most cases, the most ardent fans of the original stage show were the fiercest critics of both the movie and the sequel. This story highlights the often challenging relationships between creators and fans, and between the so-called cultural elite (like critics) and the general public. Social media has upset that careful balance. This was first apparent in the controversy surrounding the movie, and was especially evident in the three different versions of the Phantom sequel. Phantom of the Opera: A Social History of the World's Most Popular Musical features live hyperlinks that allow readers to read the text and see videos of the performances described. These videos also provide insight into the creative process and how that can change over time. The book is available for pre-order. An introductory chapter is available for download. Ultimately, the tale of the Phantom of the Opera is a story of people--the people who made it and those whose lives were touched by it. It is the story of a celebrated partnership, and the Svengali-like relationship between a composer and gifted young protege. It is the tale of fans so caught up in the original that they would have no other version made. It is the story of the creative process and how it is often iterative. It is also the story of the love-hate relationship between creator and fans, and how that precarious balance has shifted in the era of social media. Kathleen Kendall-Tackett, PhD, is a health psychologist who normally works in the area of women's health. The social history of the Phantom of the Opera is a labor of love, and is her 35th book. Praeclarus Arts is an imprint of Praeclarus Press, a small press based in Amarillo, Texas.